My husband made these up earlier in the week. I usually am not a fan of traditional enchiladas, but I do like seafood and I do like the flavor of these seafood enchiladas. Shred crab meat, shrimp, green pepper, and onion in food processor. Place mixture into mixing bowl and add remaining ingredients, mix well. 12 corn tortillas WARMED (for easy rolling) Easy way is open end of package, wrap in damp towel and microwave for 45 seconds on high. Add 1/4 cup of mixture to each Tortilla and roll open ended on both sides. In to 13x9 casserole dish coat bottom with a thin layer of Alfredo sauce, then place rolled enchiladas into dish. 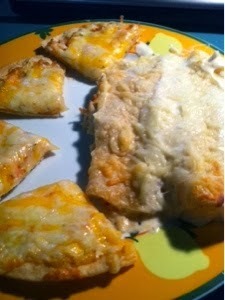 Cover with enchilada sauce and sprinkle cheese on top. Bake at 350 degrees for 30-35 minutes. let set for 5 minutes before serving. I love your combination of Crab and Shrimp for this Enchilada, looks delicious. Thank you so much for sharing with Full Plate Thursday. Have a great week and come back soon!